Tim Pawlenty is the CEO of the Financial Services Roundtable. Governor Pawlenty brings dynamic leadership and vision to an organization which represents leading financial service companies in their efforts to protect the security, integrity and success of our nation’s financial system. As a former two term Governor of Minnesota, he is a leader with significant executive experience having overseen a $50 billion biennial budget, led 30,000 state employees, and managed 20 individual state agencies and departments. As Governor, his education, healthcare, and energy initiatives were widely viewed as among the most innovative in the nation. He served as chair of the National Governor’s Association from 2007-2008 and chair of the Midwest Governor’s Association from 2006-2007. While serving as chair of the Minnesota State Board of Investment, Governor Pawlenty provided oversight for over $60 billion in investments. 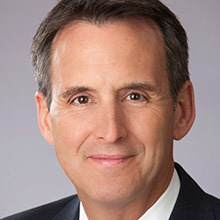 Governor Pawlenty is a nationally-respected policymaker who combines his depth of subject matter knowledge with a unique ability to communicate on complex issues. His recognition as one of the foremost thought leaders in the country brings peerless credibility to FSR and its members.